Delta Air Lines‘ points program, Delta SkyMiles, is often overlooked because it doesn’t have an award chart, which makes the number of miles needed for an award flight ambiguous. Once you get a handle on the trends in award searches and where to find the best values, you can leverage the program to your advantage. Our favorite way to earn Delta SkyMiles is by using any of the following American Express cards and transferring those points to Delta. You’ll typically accrue more points this way through large sign-up bonuses combined with generous everyday category bonuses than using a Delta card directly. You can also accrue SkyMiles by earning Marriott points and then transferring the points over to your Delta account. Delta does not publish an award chart, which can make it challenging to determine the value of the SkyMiles you want to redeem. Even though there’s no award chart, the Delta search engine is useful. The ability to search for most SkyTeam and Delta partners and the 5-week flexible search function are reasons we recommend using Delta to search for SkyTeam availability. Delta bases its pricing on the revenue cost of each flight, so the number of miles required may change when you are running your award search. 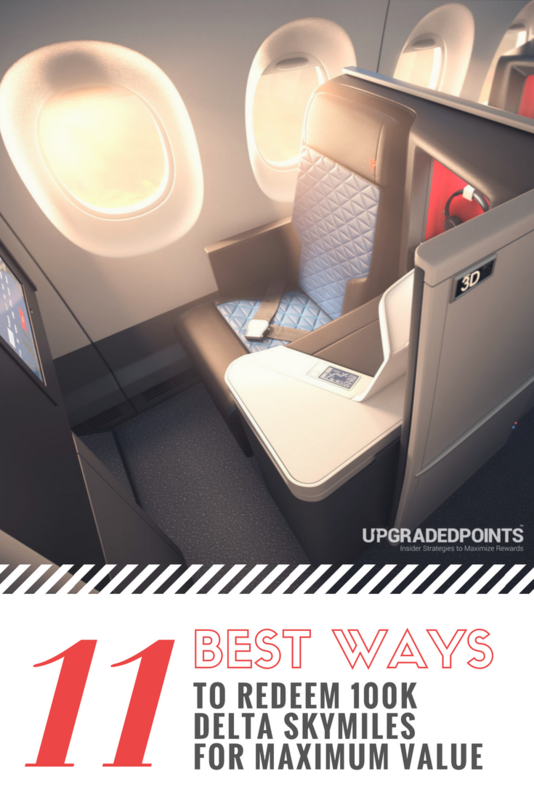 For even more ways to use your Delta points, see our other “best use” redemption article for SkyMiles. On international long-haul flights, every Delta One seat is lie-flat and has direct aisle access. Image courtesy of delta.com. 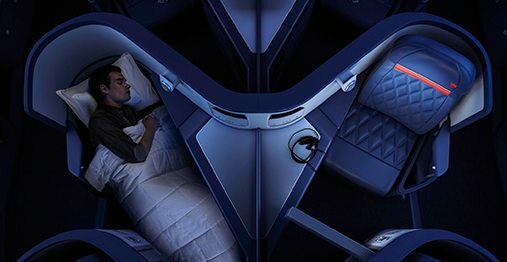 Delta transatlantic business-class flights from the U.S. to Europe can provide significant value, particularly when the equivalent cash price of those flights is high. With 70,000 Delta SkyMiles, you can book a one-way business-class flight on Delta. Hot Tip: Or, you could book 3 one-way economy flights on Delta for 90,000 SkyMiles (30,000 miles each way). Taxes and fees for one-way business class and economy flights will be $5.60. Need help booking an award flight? 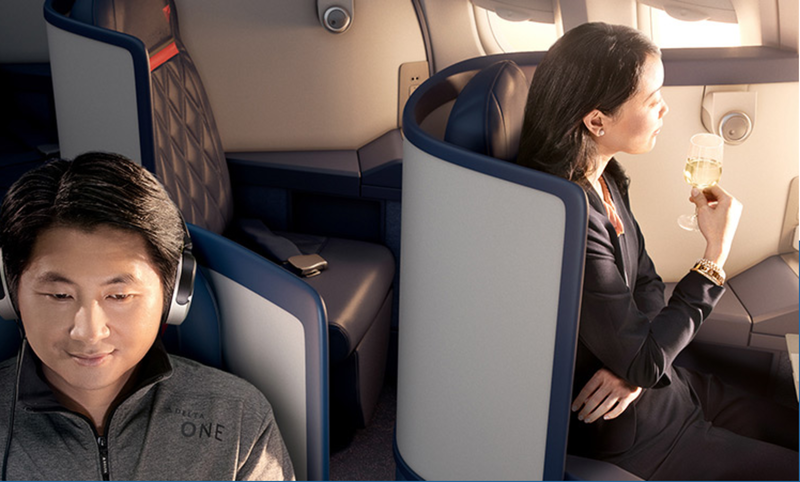 Here’s our step-by-step guide to booking Delta One. Every seat in Virgin Atlantic Upper Class has direct aisle access. Image courtesy of AusBT. Another transatlantic flight to use your Delta SkyMiles on is Virgin Atlantic. The airline flies into multiple U.S. cities, giving you options when it comes to booking an award flight. 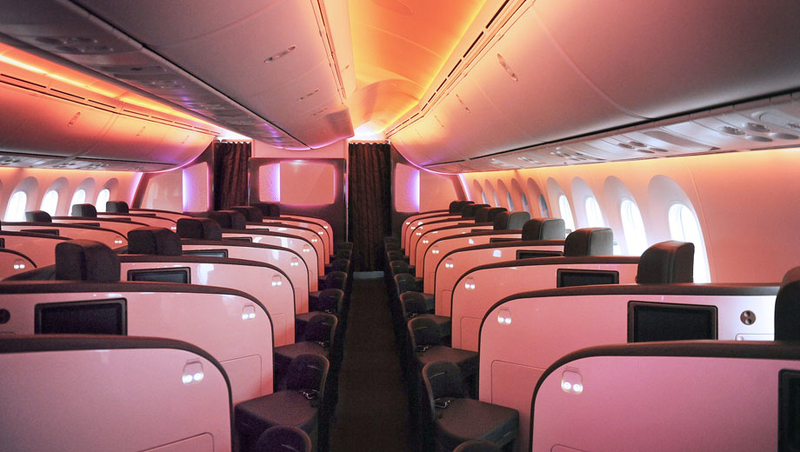 With 75,000 Delta SkyMiles, you can book a one-way Upper Class flight on Virgin Atlantic. Taxes and fees for one-way Upper Class flights from the U.S. to the U.K. will be just $5.60! An Upper Class flight from Newark is one of the cheapest award flight options for flying to London, as the taxes and fees are usually incredibly high! Need help booking an award flight? Here’s our guide to booking Virgin Atlantic Upper Class. If the first 2 transatlantic options didn’t catch your attention, here’s another to check out. Air France, like Virgin Atlantic, is another airline where you can use your Delta SkyMiles. 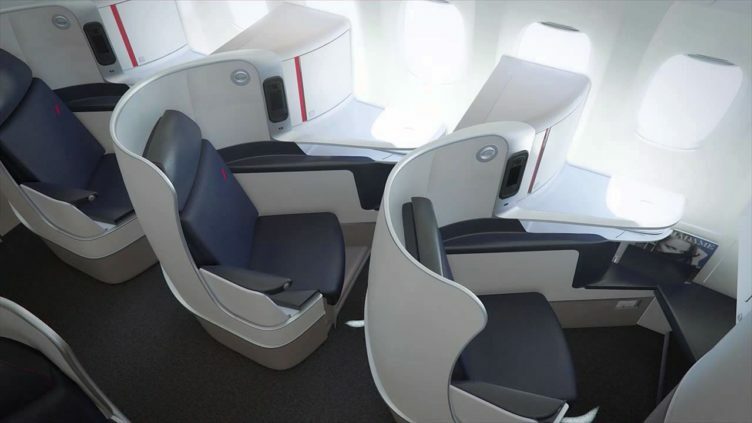 With 75,000 Delta SkyMiles, you can book a one-way business-class flight on Air France. Taxes and fees for one-way business class flights from the U.S. to Paris will be $5.60. Need more ways to redeem Flying Blue Miles? Here are our best ways to redeem Flying Blue miles. Jet Airways is a Delta partner that provides yet another transatlantic business class option. Hot Tip: If you’re based in (or can cheaply get to) Toronto, this option is a unique way to get to Europe. With 75,000 Delta SkyMiles, you can book a one-way business-class flight on Jet Airways. The only transatlantic flight on Jet Airways is from Toronto (YYZ) to Amsterdam (AMS). Taxes and fees for a one-way business class flight from Toronto to Amsterdam will be about $47. Need to earn more SkyMiles? Here are our best ways to earn lots of Delta SkyMiles. Fly to Asia in Delta One! Image courtesy of delta.com. You have several non-stop options on both Delta and Delta’s partners in Asia. 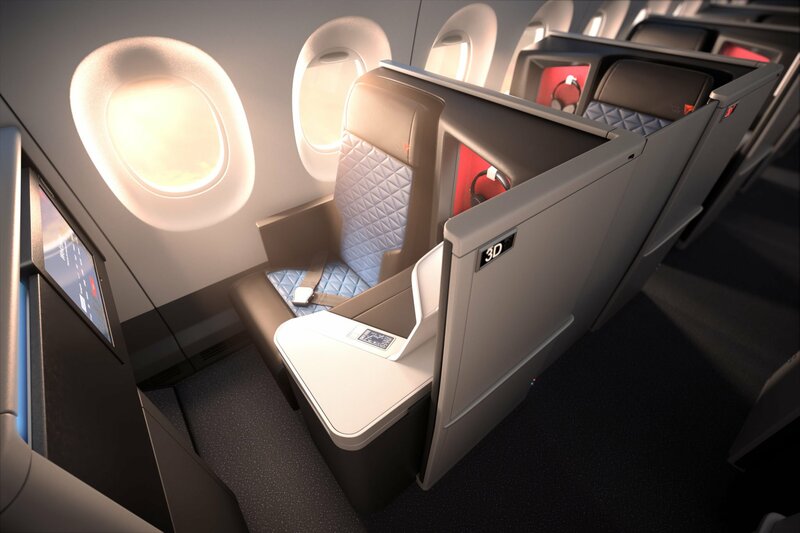 With 80,000 Delta SkyMiles, you can book a one-way business-class flight on Delta. You could also book a round-trip economy flight for 70,000 Delta SkyMiles. Taxes and fees for one-way business-class and round-trip economy flights from the U.S. to Asia will be $5.60 and about $36-$64, respectively. Need more ways to redeem SkyMiles? Here are our best ways to redeem SkyMiles for maximum value. A second transpacific option is with SkyTeam partner China Airlines. 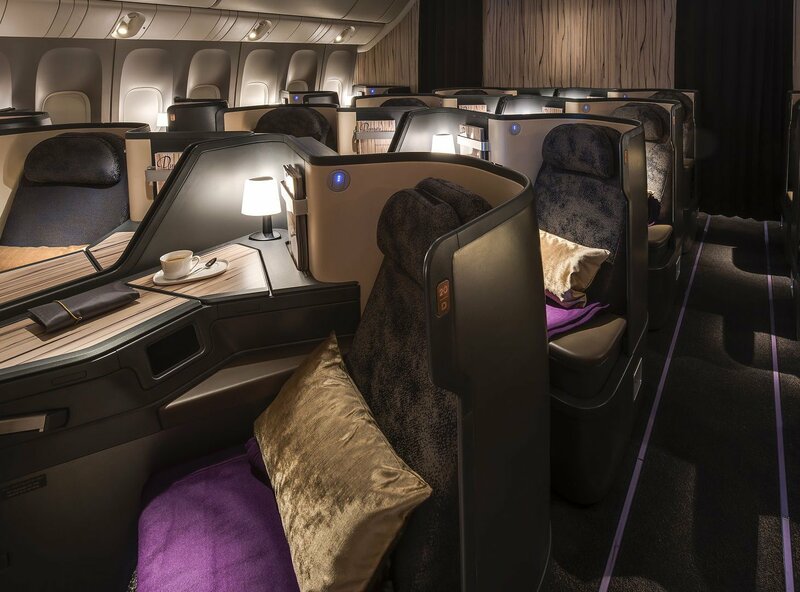 The airline is based in Taipei and has a few non-stop routes from the U.S.
With 85,000 Delta SkyMiles, you can book a one-way business-class flight on China Airlines. Or, you could book a round-trip economy flight for 70,000 Delta SkyMiles. Taxes and fees for one-way business class and round-trip economy flights from the U.S. to Asia will be $5.60 and about $39, respectively. Need another business class option in Taipei? Here are our best ways to book EVA Air business class. In South America, you have a couple of non-stop flights on SkyTeam partner Aerolínas Argentinas. With Delta SkyMiles, you can book a round-trip economy flight on Aerolínas Argentinas. The only 2 flights that you can book are from Miami (MIA) or New York (JFK) to Buenos Aires (EZE). Taxes and fees for a round-trip economy flight from the U.S. to South America will be about $92. Hot Tip: If you’re in South America and have SkyMiles to use, consider intra-South American flights on Delta partners Aerolínas Argentinas and GOL. 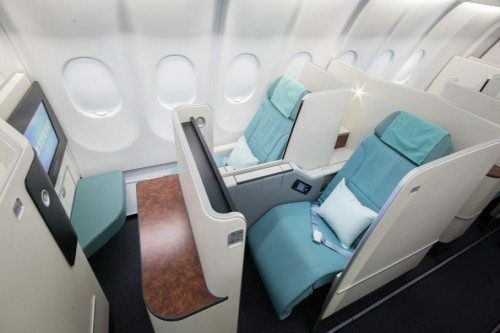 Enjoy Korean Air business class en route to Australia! 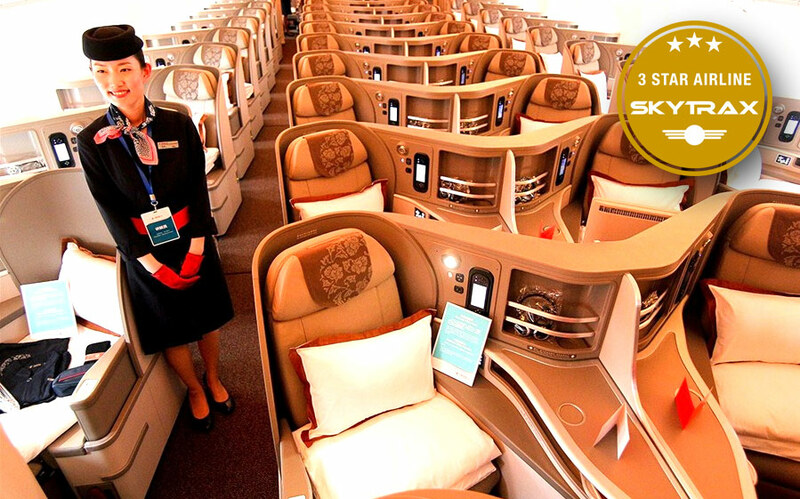 SkyTeam partner Korean Air can provide value if you want to fly from Asia to Australia. With 65,000 Delta SkyMiles, you can book a one-way business-class flight on Korean Air. You could also book a round-trip economy flight for 70,000 SkyMiles. Korean Air flies from Seoul (ICN) to Sydney (SYD), Brisbane (BNE), and Auckland (AKL). Taxes and fees for one-way business class and round-trip economy flights will be about $49-$51 and $72-$121, respectively. Need help booking an award flight? Here’s our step-by-step guide to booking Korean Air business class. Delta SkyMiles give you access to booking 2 different China-based carriers. China Eastern is likely the better option if you can choose! Image courtesy of airlinequality.com. A third transpacific flight to check out is with SkyTeam partner China Eastern. The airline flies from 4 U.S. cities to Shanghai, giving you a few award flight options. With 85,000 Delta SkyMiles, you can book a one-way business flight from the U.S. to Asia. You could also book 2 round-trip economy flights for 100,000 SkyMiles (50,000 miles per flight). Taxes and fees for one-way business class and round-trip economy flights from the U.S. to Shanghai will be about $258 and $36-$451, respectively. 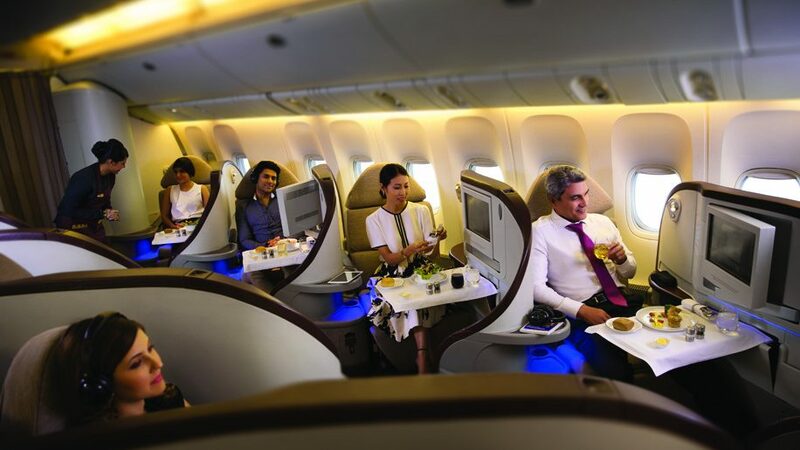 Hot Tip: SkyTeam has a significant presence in Asia with many airlines based there including China Airlines, China Eastern, China Southern, Garuda Indonesia, Korean Air, Vietnam Airlines, and Xiamen Airlines. Virgin Australia, similar to Jet Airways, is another Delta partner that can provide value for long-haul flights from the U.S. to Australia. With 80,000 Delta SkyMiles, you can book a round-trip economy flight on Virgin Australia. Taxes and fees for a round-trip economy flight will be about $142. For complex itineraries involving flights to the South Pacific, call Delta at (800) 221-1212 to look for award space. Need more ways to fly to Australia? Check out our best ways to fly to Australia with points and miles. 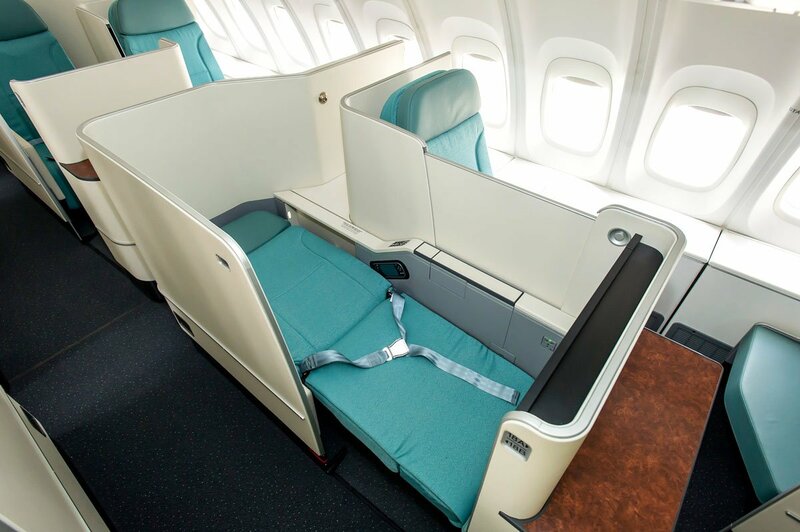 With direct aisle access and a lie-flat bed, you can rest peacefully when flying business class on Korean Air. Image courtesy of Korean Air. A fourth transpacific flight option for Delta SkyMiles is with Korean Air. The airline flies into 10 U.S. cities and 2 Canadian cities, opening up a ton of award options. With 85,000 Delta SkyMiles, you can book a one-way business-class flight on Korean Air. You could also book a round-trip economy flight for 70,000 SkyMiles. Taxes and fees for one-way business class and round-trip economy flights will be about $87 and $25 respectively. Have Korean Air miles? Check our best ways to redeem Korean Air SkyPass miles. Delta’s revenue-based program makes it challenging to determine the value you’re receiving with your SkyMiles. It’s important that you spend time using the Delta search engine to understand the value of your miles. Delta SkyMiles can provide value if you know where to look. With a number Delta flights and SkyTeam partner flights to Asia, that’s likely the area of the world where you’ll find the most value for your SkyMiles. The Delta frequent flyer program calls their airline miles SkyMiles. The points you earn from flying on Delta or a Delta partner, earn from credit card spend, and redeem for award flights are called SkyMiles. Delta provides 3 ways to earn miles from credit cards. Delta co-branded American Express credit cards earn Delta Air Lines miles while American Express Membership Rewards credit cards and Starwood Preferred Guest credit card points can be transferred to Delta. MQMs are Medallion Qualifying Miles. MQMs are used to earn elite status within the Delta program. Delta has Silver, Gold, Platinum, and Diamond elite status levels. Delta SkyMiles can be refunded into your account for $150 if your award ticket is cancelled at least 72 hours prior to departure. If you are a Platinum or Diamond member, the $150 fee is waived. Delta SkyMiles do not expire. Please remove Alaska from the list of non-alliance partner list. Thanks for the catch! This has been changed. Virtually all of the “best uses” can be bettered by using other routes. The overall lesson is that there are no really good sweet spots in the delta program, and best to concentrate your spending on other cards. “Or you could book 3 round-trip economy flights on Delta for 90,000 SkyMiles (30,000 miles each way).” Please correct – this is 3 *one-way* economy flights, not round trip flights. Thank you for catching this error. The article has been updated. Recently used 35,000 Skymiles for a one-way out of southern Africa to Europe on KLM booked just a month in advance. This was a great value as one-way’s out of Africa can be frightfully expensive. While there is less availability out of South Africa award space out of Namibia is terrific. Also noticed good KLM/Air France availability from Kenya and Tanzania to Europe. For those on RTW itineraries this can be a really nice use of Skymiles. These are extremely helpful data points Steven. Thanks for sharing! Telephoned Delta today May 31 to inquire Sky Miles mileage requirement for a one way Business Class ticket LAX-CDG early July on AF———— 175,000 miles!! Onto Budapest 225,000 miles!! Without an award chart, we have no idea what Delta will charge on certain routes. Based on my own experience, the more popular routes and dates closest to when you are wanting to book a flight will require more points. If you have UR or SPG points, consider using Korean Air to fly Air France non-stop from LAX-CDG for 50k in economy or 80k in business round-trip. After reading posts for several hours I am discouraged that my Delta miles are obviously the most expensive ones to own. You can use Chase, Amex and SPG (for another month anyway) for a lot better deals if I am not mistaken. I will keep Delta for the free bags and the perks that come with it but after all of your excellent posts I am rethinking my spend for sure. Any idea what is going to happen with the SPG card and earnings after Aug 1st? Thanks for writing such informative and educational pieces. We recommend earning transferable points (like you are thinking) so that you can hedge yourself against program devaluations like we’ve seen with Delta. Regarding SPG, the personal SPG card will experience an earning’s devaluation while the SPG biz card will become more valuable. The new SPG/Marriott is launching a new high end card ($450 annual fee) in August so we recommend being on the lookout for more details on that card in the next 45-60 days. Please let us know what else we can do to help! Have 260 k Skymiles in one account and 190k in another . Recently can’t find any award in BZ for less than 250 k *+. Just this March I had found a way to get to Dubai on VA and Paris via AF .. return .. for like 190 k total . Based on your professional experience are those prices ever coming back or do they release seats closer to the date( read your blog in AF releasing 331 dates ) .. was hoping to go in August ? You should be able to book business class on Delta partners for 170k rt + $135-$152 in fees. I have about 100000 delta sky miles. I need to travel to India towards this year end and wondering how best I can use my Delta sky miles for this trip. Any recommendations would be really great! It’s going to cost anywhere from 80,000-100,000 Delta SkyMiles to fly in economy round-trip to India. If you travel to India often, check out our newly published guide on the best ways to fly to India with points and miles. Keep in mind it’s focused on business and first class travel, but we think it will help you a lot regardless! Unfortunately, award availability can be difficult to find for Air France. The best tip we have is to play around with your dates and be flexible. Delta miles are pretty pointless. I have over 110,000 miles. Whenever I try to redeem them the fee I have to pay in addition to using the miles is actually 90% of a new ticket cost…. totally useless. And it’s always been that way. On Lufthansa, for example, I don’t recall paying any extra fees. It’s just the opposite. Delta very rarely has taxes and fees. What flights are you looking at that charge “90% of a new ticket”? Lufthansa passes on ALL fuel surcharges, so it’s actually not the best idea unless you meet certain, very specific criteria.